1. Melt butter and sauté onion until soft. 2. Combine all ingredients. Mix well and pour into greased casserole pan. 3. Bake at 350º F for 55 to 60 minutes or until crusty and golden brown on top and not wobbly when shaken. Serve warm. 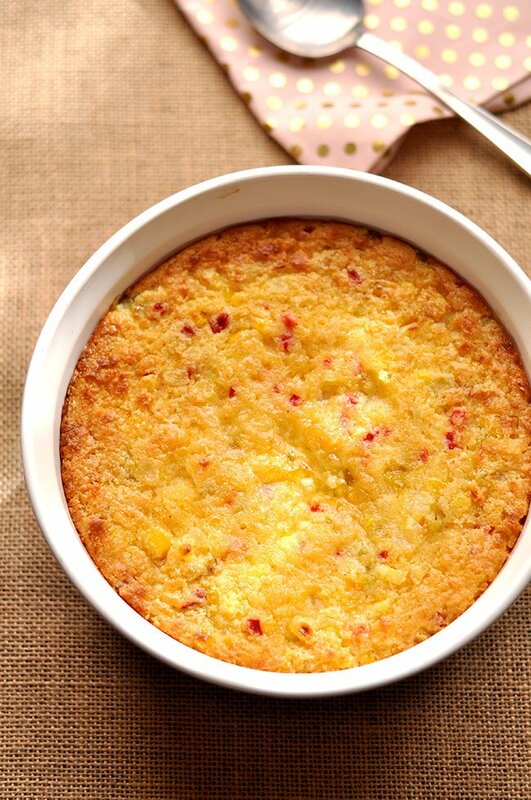 This baked corn casserole is so delicious! It’s all you may already love about corn casserole plus some added flavor including my secret ingredient—pimentos! I first sampled creamed corn casserole recipe at a work party. And by sampled I mean had 3-4 helpings. 😬 It was so good though and I didn’t even feel bad about it because I saw everyone else going back for more too. This coworker of mine and her hubby enjoy entertaining and have it down to a science. She has spent a lot of time testing out recipes and when she prepares a spread, it’s nothing but dish after dish of awesomeness. Every year she and her hubby host a picnic at her house and the food is always off the hook. She actually takes the day of the party off in order to prep the 10+ homemade dishes she serves up. It is really a treat. Not to mention her house is amazing with fresh herbs growing in the wooded backyard along with fountains, comfortable seating, great music piped in, a fire pit, grill and probably one of every species of bird that’s in the area because she even has an awesome variety of bird food readily available. Anyway, lucky for me and you, she’s very willing to share her recipes. Two of my favorite dishes of hers are this baked corn casserole and her Garden Tomato & Cucumber Orzo Salad. I promise neither will disappoint. 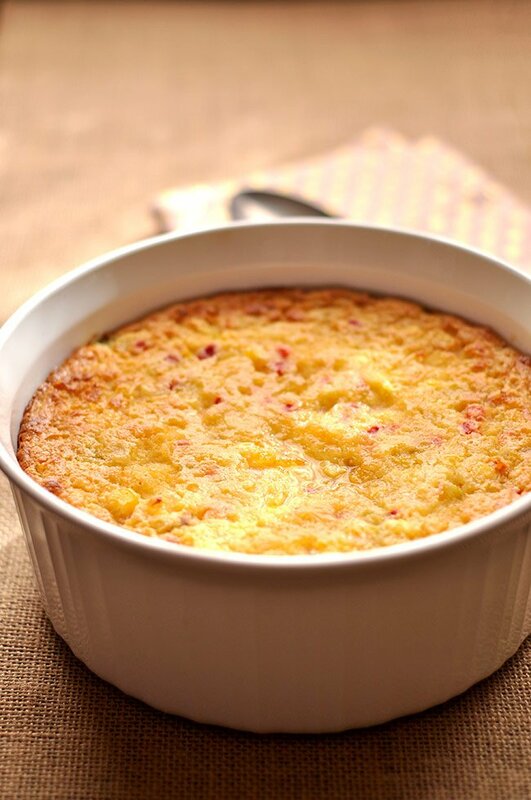 What makes this the best corn casserole recipe? The sweetness of the corn is perfectly balanced out by the subtle heat brought in with green chilis, pimentos and a pinch of cayenne pepper. Need a casserole dish to make this? Even if you think you are not in dire need of a new set of casserole dishes, I’m telling you, you are. 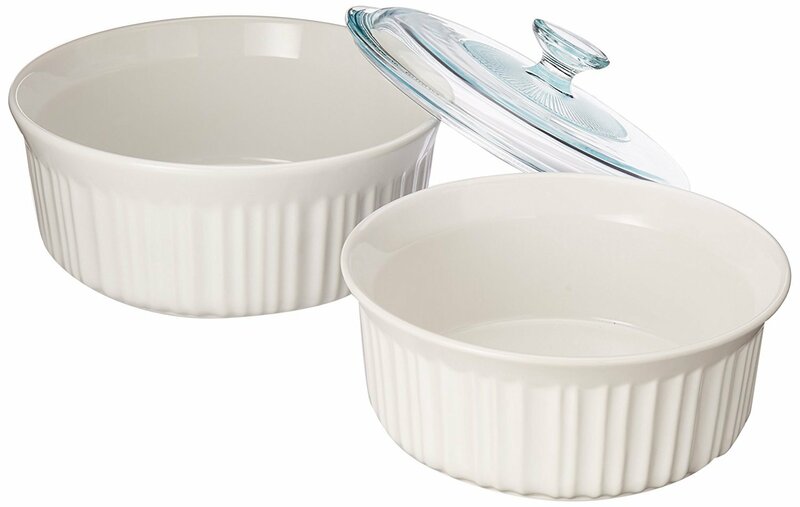 I am phasing out my glass Pyrex casserole dishes in favor of this Corningware casserole dish set. They’re just plain cuter and that’s important if you’re taking this as a side dish to a party or a pot luck. You get similar properties of glassware cooking without the yucky staining that happens with glass dishes. They’re a little more fragile but if you’re using them as a baking and serving dish, it’s a nicer presentation. So, save your glass casserole dish for weeknight dinners and freezer meals. And break out these beauties for a special occasion. Hello, Thanksgiving, Christmas… I’m looking at you. In need of some additional side dishes? Browse all my side dish recipes. 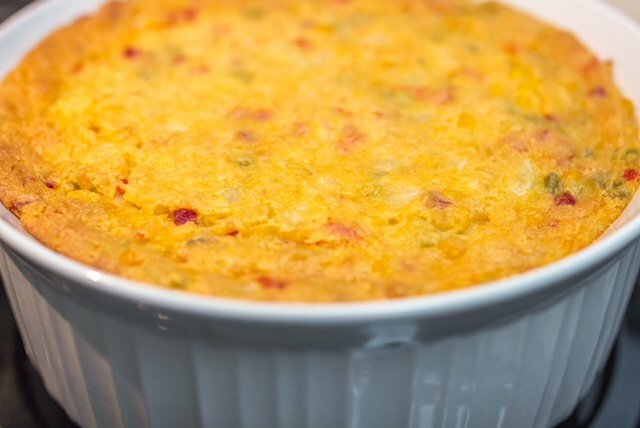 This corn casserole with pimentos was featured on Back to my Southern Roots! This was super tasty and a huge hit at Thanksgiving. I’ll be making it yet again for Christmas, and I can’t wait! YUM! I’m so glad you enjoyed it, Tracy! Have a Merry Christmas!